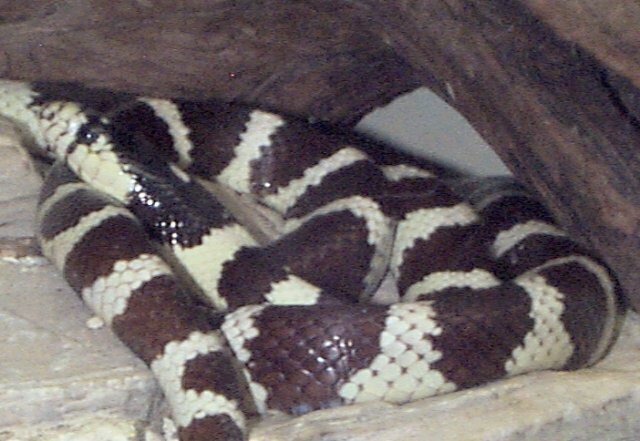 The Kingsnake is approximately 30-70 inches in length. 2-3 inches of the total length is the tail. The Kingsnake is typical of most snakes in that its lower jaw unhinges enabling it to swallow its meal. The lower jaw consists of two seperate halves that are connected by elastic tissue. Pictures of numerous snakes can be found at Photovault under Reptiles. 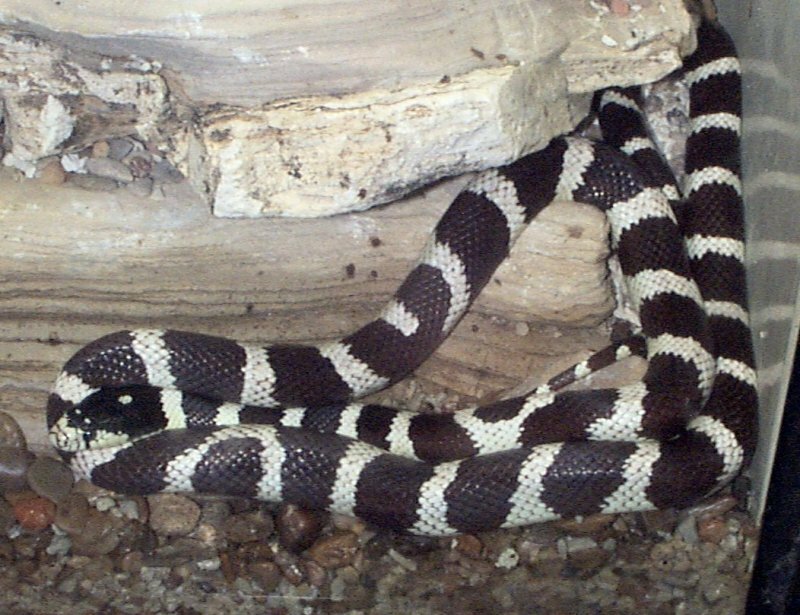 California Kingsnakes usually are solitary creatures. They search for rodents, lizards, frogs, etc. by themselves. The only time Kingsnakes are not solitary is when they hibernate during cold weather. During hibernation you can find many Kingsnakes at one site. During the spring they separate and continue their solitary lifestyle. This snake is a frequent consumer of other snakes including venomous snakes and other Kingsnakes. They frequently eat other snakes because the shape of snakes allow ease of swallowing. Kingsnakes kill prey by looping around, constricting and squeezing its victim with coils. The meal is swallowed head first as saliva lubricates the victim's body. The ability of the jaw to unhinge makes it easy for the Kingsnake to devour its prey. Eating a prey is time and energy consuming. It was once thought that these snakes were able to eat venomous snakes due to their immunity to the venom. It is now known that Kingsnakes are not immune to venom but has tolerance towards it. This snake can be aggressive if provoked. Despite all the positive features of this snake, it also has some negative features. This snake, similar to most snakes, has bad eyesight due to the positioning of the eyes on the sides of the head. This positioning of the eyes make it difficult for the snake to focus although the California Kingsnake has good "close up" vision. A prey has a better chance of survival if it stays still. * The Kingsnake's jaws are hinged, allowing them to swallow prey that is larger than their head. They also have a tolerance towards rattlesnake venom which enables them to kill and consume the rattlesnake. If a large dose of venom is injected into the head or heart of the Kingsnake, death may occur. 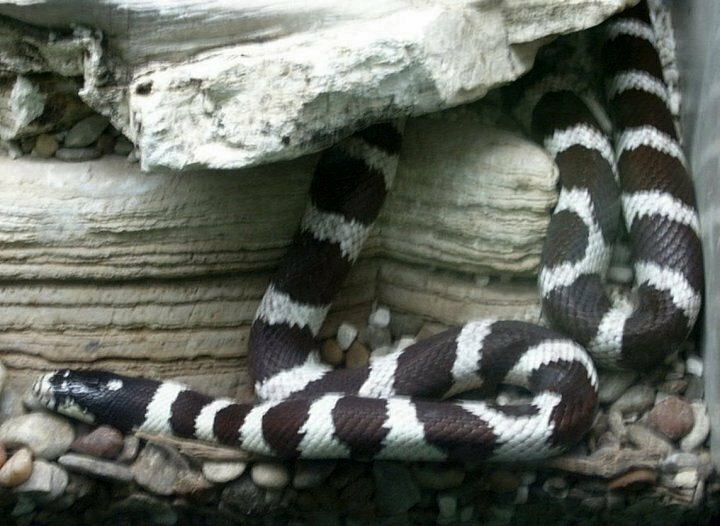 * The California Kingsnake has many special features. It has a spine consisting of 100-400 vertebrae and each vertebra is attached to a pair of seperate, thin ribs. This anatomical adaptation allows the snake to coil, climb and move in an S shape. * The Kingsnake can hear low frequency sounds and feel vibrations. This enables them to sense an approaching animal well before the animal actually reaches the area where the snake is located. * The Jacobson's organ and the snake's fork shaped tongue allow the snake to smell its environment. The Kingsnake is oviparous. It lays approximately fifteen eggs. It mates from March to June and lays its eggs from May to August. Six to ten weeks later the eggs hatch revealing kingsnakes that are 8-13 inches long. Similar to most reptiles, the snake does not take care of its young after they hatch. In the wild, the snake lays its eggs once a year although it is possible for it to lay eggs twice a year. I conducted a phone interview with Steve Hammack of the Fort Worth Zoo. He talked about the many phases of the California Kingsnake. There are a variety of Kingsnakes scattered throughout North America. The color of the snakes depend on the location of the snake. The Kingsnake with black and yellow rings located at the Forth Worth Zoo is the one he spoke about. He stated that most Kingsnakes of this phase are located in the deserts of Baja California. The snake at the zoo is a female that was bought from a breeder. The snake was not actually a wild animal captured from Baja California. This snake did not appear very physically active. It did not move much. I noticed how shiny the skin appeared and the small head size relative to the body. The kingsnake is a very docile reptile and it is very easy to keep it in captivity. Due to this fact these snakes are frequently bred and sold to the public. There have been some cases where some Kingsnakes have been captured from the wild and sold to consumers. I disagree with this act simply because wild animals that are used to their natural habitat and freedom should not be captured and caged.